Brrrrrr it's cold up North.Wouldn't you love to cozy up under a Hudson Bay point blanket... or at least tote one with you throughout the day to bring warm thoughts? 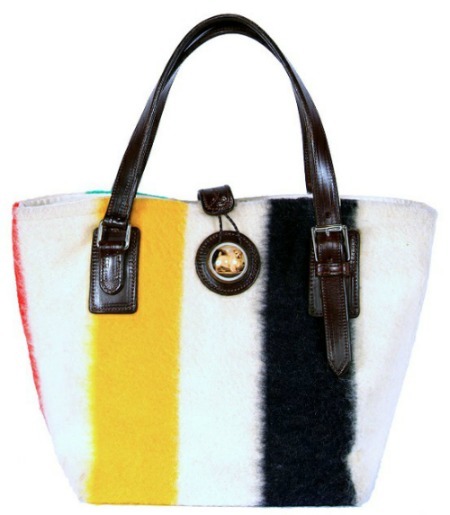 This bag by Rebecca Ray Design is made from the iconic Canadian vintage blankets and has over 40 options for the bridle rosette (I think I would choose the fox). Love love love! Maybe I should have started this off by saying you could wear the blanket instead of tote it...Rachel Bilson in Smythe at the 2010 Winter Olympics in Vancouver. Luxe version... one side blanket other side coyote fur. I wish it came in faux. The pattern is also known as the Glacier National Park Blanket by Pendleton (available here), as seen with Atlantic-Pacific last summer. You may have seen it at Urban Outfitters. I could use the blanket right about now! I was not prepared for this COLD! Love those- I never knew where they were from! And seriously it's flippin freezing!!! That jacket looks amazingly comfy! Love all of those! How gorgeous is that coat!!! I love Pendleton, and Pendleton blankets! They're so nice, and I definitely need more in my life. I LOVE THE JACKET!! I need this! I'd love to have that blanket with me right now- it looks so warm and cozy!! Love the blanket. But, I agree, unless it came in faux fur I would never buy it. Holy coziness! These look amazing. Is it too soon to be creating 2012 Christmas List? As a Canadian, I still find it odd to see a Hudson's Bay blanket anywhere! I grew up with the Bay...and that stripe on everything.